Welcome to Nemaco Technology's reference section that provides technical information for NEMA 6P enclosure specifications. 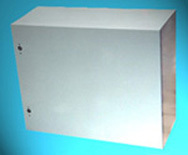 Nemaco has dedicated a technical section for each type of NEMA enclosure. This technical reference section is about the type NEMA 6P Enclosures, you will find detailed information for the NEMA ratings & defintions. Nemaco will try to provide some samples of NEMA 6P enclosures in this section. Also and whenever possible we will provide internal and external photo images of the enclosures. 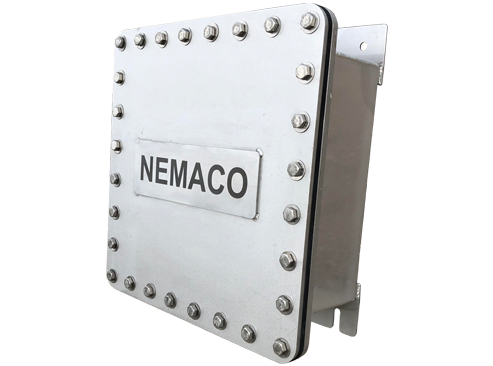 You can call Nemaco for additional information if needed so you can find the correct enclosure for your industrial, commercial or military application. Definition: Enclosure or metal box intended for indoor or outdoor use which occasional prolonged submersion is encountered. Corrosion protection is required for the NEMA 6P Enclosures. 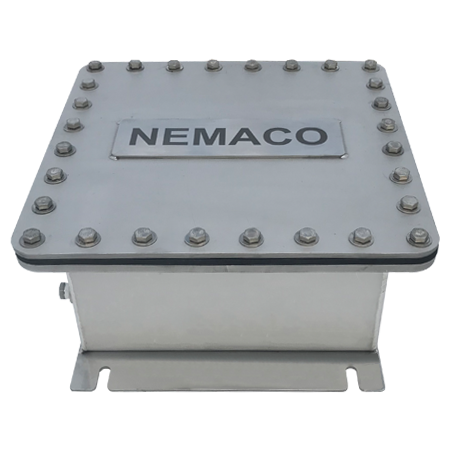 Nemaco Technology offers NEMA 6P enclosures fabricated from 304 & 316 stainless steel, aluminum and other materials per customer's request. Most customers prefer stainless steel NEMA 6P enclosures since the enclosures are durable and they can be modified in the field by the customer if necessary. The stainless steel NEMA 6P enclosures provide greater durability than inexpensive (extruded or molded) plastic enclosures. Also, 316 Stainless Steel offers more corrosion resistance than 304 stainless steel due to the additional chrome content contained in the metalurgy. The process of stainless steel pickling and passivation should be done for additional corrosion protection for some applications. 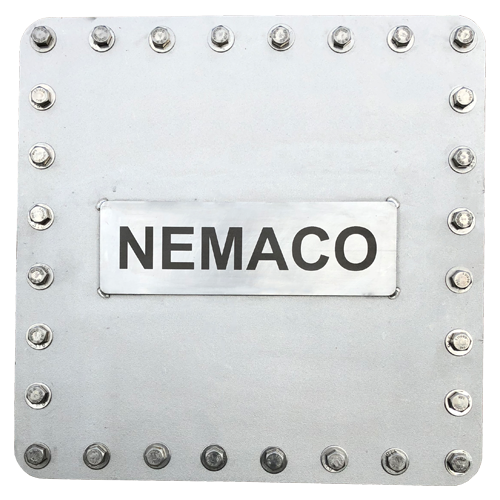 Nemaco can provide enclosure pickling and passivation per the customer's request. Note that two of the NEMA 6P enclosures that are shown have additional coatings per the customer's request. The photo of the gray NEMA 6p has marine epoxy coatings on 316 stainless steel per the customer's request for an unique application. And the another NEMA 6p enclosure was manufactured from aluminum and then powdercoated for a telecommunications application. A typical example of NEMA 6P enclosure would be a 316 stainless steel metal box used for electrical controls in any outdoor environment that is wet and there occasional prolonged submersion due to storm waters, tide on river or ocean bay. 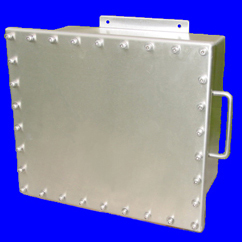 Sometimes NEMA 6P Enclosures are used in waster water treatment plants or use for junction and pull boxes. Call or send Nemaco if you have any questions about your particular NEMA 6P enclosure application. 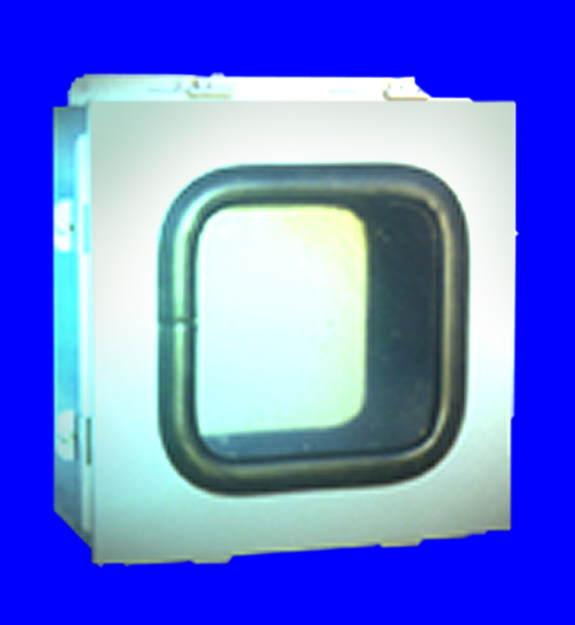 Call Nemaco for NEMA 6P enclosures and any other custom stainless steel enclosure designs.